Montana Sportsmen Alliance PAC: IF YOU’RE THINKING OF HIRING AN OUTFITTER…. IF YOU’RE THINKING OF HIRING AN OUTFITTER…. Many folks, at one time or another, and for various reasons, choose to enlist the services of an outfitter as a means of enjoying Montana’s great outdoors. Outfitters make their living based on the public’s resources and as such, have a responsibility and an obligation to their clients, the resources they use and the public at large to do so upholding the highest standards of professionalism and dedication to sharing those public resources. 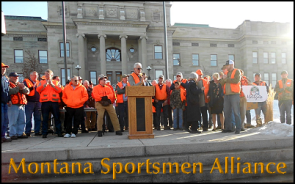 The Montana Sportsmen Alliance generally focuses on issues and policies affecting resident Sportsmen, most of which do not use outfitters. Yet, we recognize that both residents and non-residents alike do have occasion to utilize them. We believe that only licensed outfitters with proven records of operating safely, using equipment in good repair that provide a quality, ethical and legal service merit support. In light of recent developments and proposals by the Montana Board of Outfitters (the state agency that licenses hunting and fishing outfitters) that we believe directly affects the quality of outfitted services licensed outfitters provide, we believe that “consumers” should do extensive homework prior to hiring an outfitter and committing funds to a trip. Outfitter members of the Montana Board of Outfitters voted to change the first aid certification requirements for outfitters and guides. Previously, outfitters and guides had to have annual re-ups of training. The new rule requires only one, in-person, hands on training for a lifetime and then subsequent on-line “refreshers” from then on. MSA opposed this change, as the nature of first aid training changes over time and the annual hands-on training provides not only currency but physically requires an individual to demonstrate competency. We believe this change will adversely affect the safety and welfare of both outfitted clients and the general public as well. Additionally, it also affects Outfitter Assistants (unlicensed, untrained guides) who are currently allowed as “emergency guides” when an outfitter encounters a last minute, unanticipated shortage of staff. It should also be noted that Outfitter Assistants are not subject to ANY guide licensing requirements or training, including first aid certification. There are no background checks or law enforcement checks. Literally anyone qualifies regardless of track records. The Montana Board of Outfitters is accepting comments on a rule change until April 13th at 5 PM. The rule pkg includes rules on Outfitter Assistants. Comments can be made to the Montana Board of Outfitters at dlibsdout@mt.gov. 1. Make sure they are licensed. If a hunting outfitter only operates on private land held by the outfitter in title he/she does not need to be licensed by the state. If however, they use any land not belonging to them (a neighbor, friend, etc.) or operates on any state or federal lands, or on a Montana river, they must be licensed. Be sure you’re hiring a legal, licensed (if appropriate) outfitter. The Montana Board of Outfitters lists all licensed outfitters on their website. 2. Has this outfitter used Outfitter Assistants? If so, how many? Use of OA's could be be an indication of ongoing poor planning, poor business plan, and a spur of the moment approach to the business, taking shortcuts and as a result, affecting the potential quality of your trip. Outfitters using Outfitter’s Assistants are supposed to disclose to the client if the person guiding him/her is an Outfitter’s Assistant and if they have first aid training as soon as possible. You should have the option to decline the trip or the specific guide’s services if you feel that he/she does not meet muster or if it appears that the trip is being cobbled together at the last minute. 3. The potential for abuse and disappointment in a trip can be very high. Be sure that all of your expectations as well as the outfitter’s abilities to meet them are clearly and fully articulated and in writing. Make sure you are getting what you need, what was promised and what you pay for. Websites often tout the experience and qualifications of guides. They don't talk about OA's. Shop around and see what’s out there and how various outfitters portray themselves. Ask for references. If it is important to you, specify from the start that you demand only a licensed guide with first aid training, no OA's. 4. No outfitter can guarantee success of taking game or fish on a trip. They can give stats on how many of their hunters took game or what generally to expect in a fishing trip. Success, however, is dependant on so many variables (many of which are outside the control of an outfitter) that short of tying an elk to a tree or fishing in a stock pond, no one can guarantee results. If the outfitter makes guarantees in taking game or fish in their advertising or in speaking to you, go elsewhere. Seek truly ethical fair chase pursuits. 5. Montana has lots of high quality outfitters. Make sure you get what you are looking for in terms of services to have the type of trip you want. In the course of hiring an outfitter, keep a written record of your calls, what was discussed, any costs and conditions mentioned and keep correspondence. Most outfitters require a non-refundable deposit for trips. Check to see if there are exceptions and be sure to document any funds sent as a deposit. Legal and ethical outfitters are not afraid to put down in writing (a contract) what their terms and services are. Be wary of verbal agreements. dlibsdout@mt.gov You may file a written complaint with the Board on which the Board has the obligation to investigate and possibly, prosecute. Legal issues involving the unlawful taking of fish or wildlife during a trip should be reported to Montana Fish, Wildlife & Parks law enforcement personnel, Montana Game Wardens. During hunting season and in the field, reports can be made to the poaching hotline, TIPMONT (1-800-TIPMONT) or electronically at http://fwp.mt.gov/enforcement/tipmont/reportOnline.html During business hours, questions regarding legal issues can be addressed to the Law Enforcement Division, Montana Fish, Wildlife & Parks, (406) 444-2452. If you see something, say something! It is every sportsmen/women's duty to report violations. Only through efforts expended prior to a trip can you be assured of getting all you pay for, not to mention a quality experience. It is also a way to support and encourage those who are doing it right and eliminating those who are not from the ranks of those doing business in Montana.